On the attractive, tree-shaded campus of Dakota Wesleyan University, I located my next destination: the Dakota Discovery Museum. Alas, photography is not allowed inside, so I can’t share the wonderful things I saw within the museum. Fortunately, however, they also collect historic buildings, and those I could photograph—and which you’ll see in the next post. 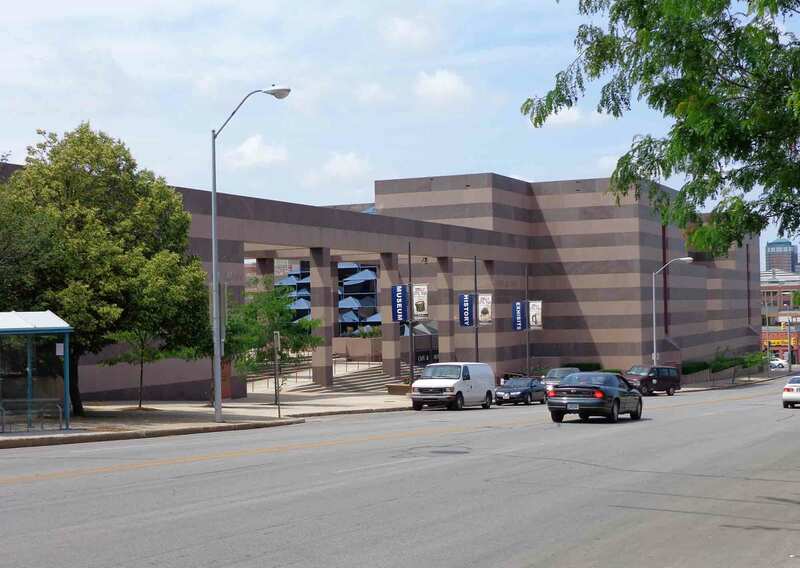 The museum focuses as much on Native American culture as it does on European history in the region. The quillwork was glorious, and it was interesting to see it morph into beadwork, as glass beads became available with the introduction of the fur trade. Walking around the museum, the displays continued to reveal the changing frontier, from Native American to fur trade, pioneer to farmer, growing towns, and into the 20th century. There were a few big items, such as a threshing machine and an old sheep wagon fitted out as a horse-drawn mobile home. However, most exhibits focused on the intimate details of daily life. Wonderful. Rod Brown, the newly appointed director of the museum, seeing that I appeared to be more than casually glancing at exhibits, introduced himself and began to offer interesting details on the history of South Dakota. On a large map, he pointed out the Missouri River, which I normally associate with Lewis and Clark, but Rod related that this constituted the South Dakota’s “middle border.” People to the east of the river moved here from the East, and those west of the river moved from the West. There are definite cultural differences between the two regions, which are identified by locals as East River and West River. West River tends to be more Wild West. That’s where you have Deadwood, the Badlands, and the Black Hills. There is more tribal influence in West River, and more ranching. East River is more farming, and the landscape is less dramatic. A further designation is Middle Border Country, the land immediately adjacent to the river, on either side. The proximity to the water made this area easier to settle—even before Europeans arrived (hence the Prehistoric Indian Village on the other side of town). It’s a great place for farming, and following the river leads through a lot of handsome farms. Mitchell is solidly in Middle Border Country, as are most of the Hutterite Colonies founded here. The largest ethnic groups to settle Middle Border Country were Germans and Norwegians, though there were also settlers from Bohemia, China, Denmark, Finland, France, Great Britain, Hungary, Luxembourg, Poland, Sweden, and Switzerland. So a remarkably diverse area. Then time to head upstairs. 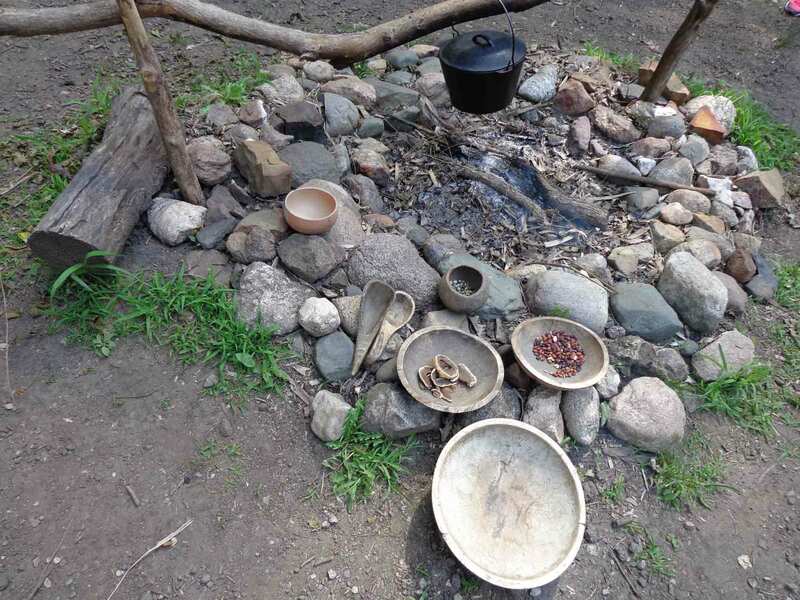 A couple of posts ago, I mentioned that the Native Americans who lived at the Mitchell site made pemmican as a trade good. If you wondered what pemmican tasted like, there are a lot of videos and books out there that will share with you how to make your own, authentic pemmican. Alternatively, you can save yourself the trouble and check out Tanka Bars—updated versions of the classic Native American energy food. 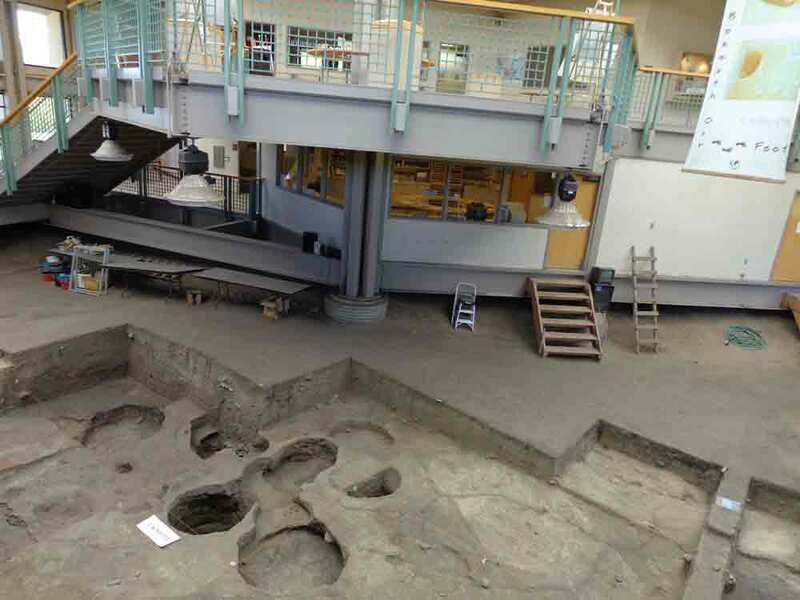 The Archeodome is a building that encloses a significant part of the dig site for the Prehistoric Indian Village. This enclosure means that digging can take place at any time, and it doesn’t have to be covered every time archaeologists leave, to protect the artifacts. While they don’t have the money (one docent told me) to have a year-round archaeologist, if one wished to work year round, he or she could. The dig site (which is more extensive than what you can see here) is set up with the laboratory right next to it. 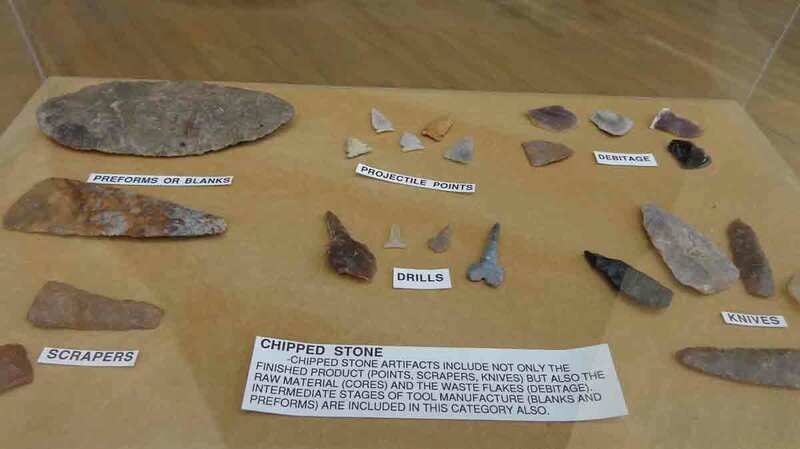 There is a display of tools used in archaeology, signs that explain the layers and what has been found, and the site itself. A winding ramp leads up from the ground floor to a second floor filled with exhibits, artifacts, and more informational signs. With 1.5 million artifacts already dug up here, the hard part is narrowing down what you want to show. They’ve done a good job. 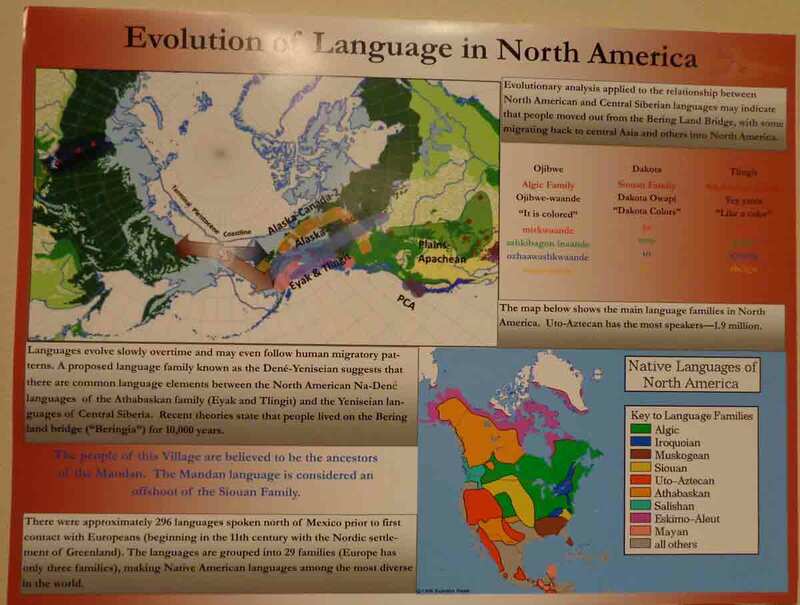 I was delighted to see extensive information on corn and its importance to Native Americans, along with maps showing the original “Corn Belt” in 1450. In my book and in the presentation I give on the history of corn, I mention something called pod corn. Corn mutates easily—which is, in fact, how it came into existence—but not all mutations are equally successful as, say, sweet corn and popcorn. Pod corn is actually pretty close to useless. No one grows it commercially, with its chief virtue being in its genetic material—plus it looks cool. Every single kernel in this odd corn variety has its own husk, plus the whole ear has a husk, as well. 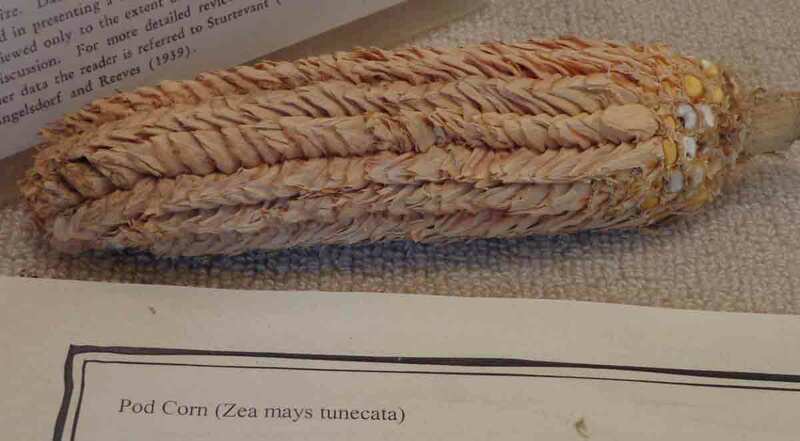 When I’m speaking about corn, I describe it as looking like someone tried to make an ear of corn out of straw. Do you think this actual ear of pod corn matches my description? Despite the fact that this is a National Historic Landmark, you may discover that your GPS can’t get you to this place. Fortunately, if you just drive north on Main St. a couple of miles from the Corn Palace, you’ll see a sign at 23rd Avenue (left turn if you’re heading north), and that will at least direct you to the right road: Indian Village Road. Turn right at Indian Village Road and drive until you see a parking lot on the right, with a few signs suggesting that something is nearby. Hike down the hill, past information signs with Native American symbols and some very interesting information, cross a little bridge over an inlet of lovely Lake Mitchell, and follow the path up the low hill on the far side. 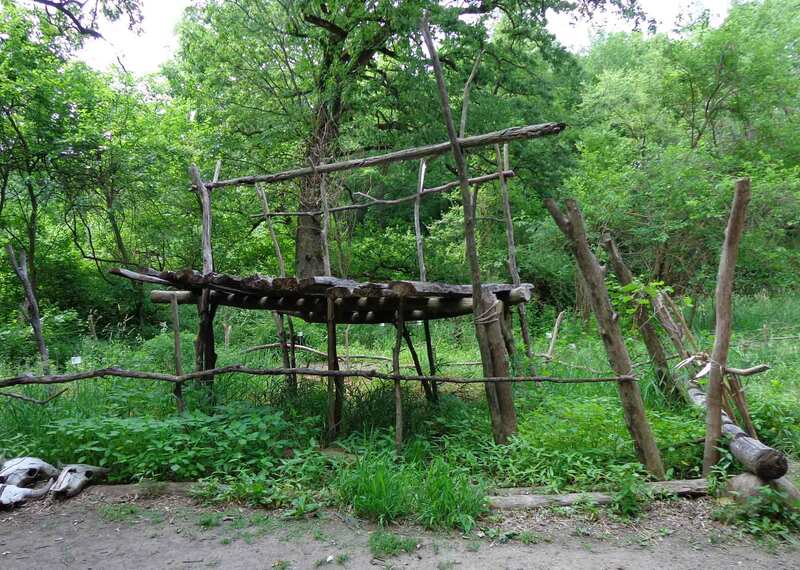 This will bring you to the Prehistoric Indian Village Museum. It’s worth the small effort required to find the place. What you will reach first is the museum, where you will be introduced to the culture of the people who inhabited this point of land around AD 900–1000. There is a short, excellent movie on the people who once inhabited this area, followed by a docent-led tour, and then you can explore on your own. 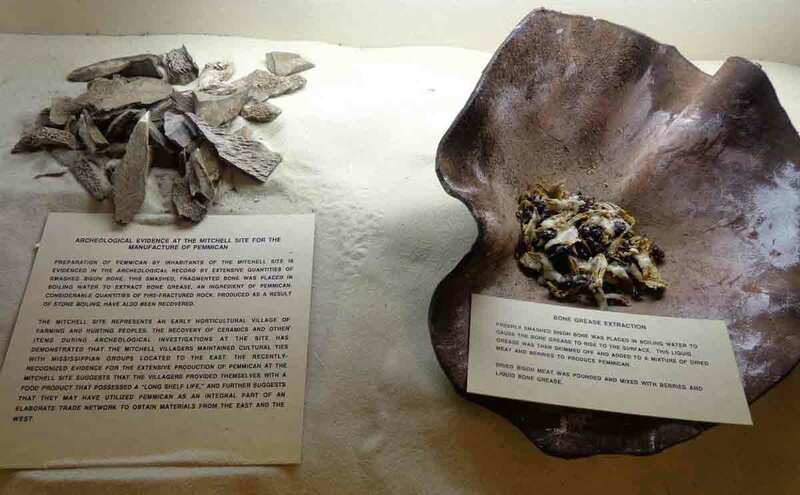 It is not a large museum, but the exhibits are rich with artifacts and information. Roughly 1.5 million artifacts have been found at this sight, and many of them are on display in the museum. 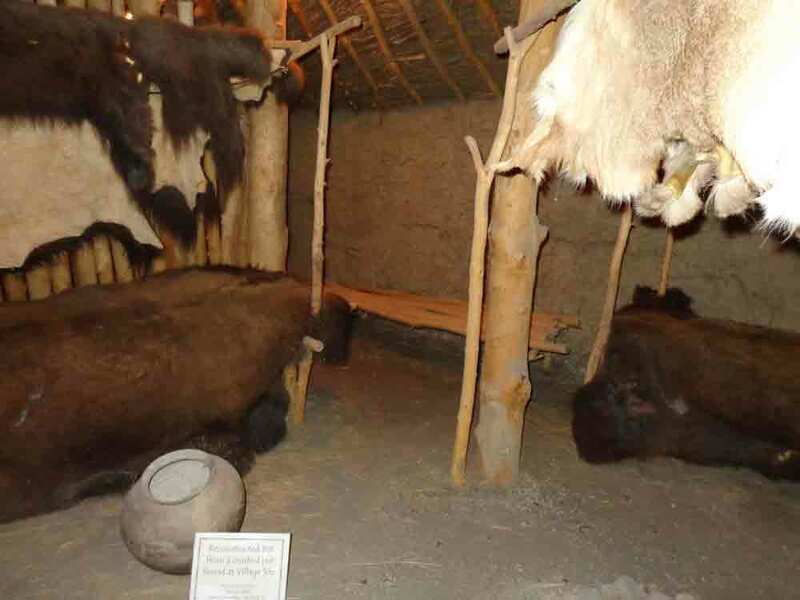 A full-size reconstructed lodge, like the ones that housed the original inhabitants, offers insight into what living conditions were like. Wood poles make up the roof of the lodge, and it was these that eventually required that the people move. There is very little wood on the Great Plains, so after about 100 years, there was no source of wood left, so the people migrated northward. It is thought that they were the ancestors of the Mandan, people who hosted Lewis and Clark when they arrived a few hundred years later. Abundant maps and signs help establish where people settled and how they moved around, where languages originated, and what trade goods passed through. The people who lived here were part of a vast trading network. The patterns on the pottery can be traced to Cahokia in Illinois. Only broken pots have been found, however, because they would have taken unbroken pots with them when they moved. The trade good that was produced here appears to have been pemmican, a handy “energy bar” made of dried meat (generally bison), dried berries, and fat, that was great for travel or to get through a rough winter. 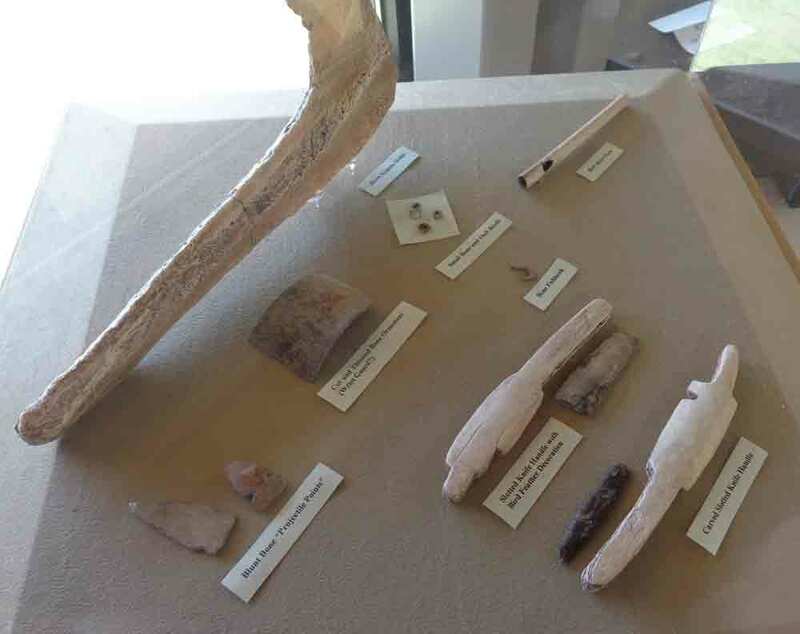 The evidence that suggests this as an important trade good includes a disproportionately large number of broken buffalo bones—far more than could be consumed by the people in the village—along with equipment and supplies that would be used in creating pemmican. Corn had come north with these people, as well as squash and beans, and these were in evidence in the exhibit, as were tools used in farming these crops. A hoe made of the shoulder blade of a bison and a rake made of deer antlers were propped up near the lodge, and it struck me that they looked remarkably like tools used in so many other parts of the world, both then and now. Lots more to learn and see, but I figure I had better leave something for you to discover on your own. Off next to the Archeodome, across the broad, green lawns that border Mitchell Lake. Next morning, I headed off for a day of exploring. Jane had contacted the Nebraska History Museum to arrange for a docent/guide for me, and the wonderful Jack Chaffin was waiting for me when I arrived. Of the many Native American groups that were here when Europeans arrived (Pawnee, Omaha, Ponca, Oto, Ioway, Sac, Winnebago, Cheyenne, and Arapaho), about half were moved to other states and about half adapted and are still living in Nebraska today. Pawnee were one of the largest groups in the area, and the Skidi Pawnee was the largest Pawnee group. The Skidi brought Aztec astronomy with them when they moved north from Mexico. They grew four different colors of corn: red, blue, yellow, and white. Ft. Atkinson, north of Omaha, had the first bowling alley in Nebraska. Dr. Susan LaFlesche Picotte, an Omaha, was the first Native American to become a doctor, graduating, in 1889, at the top of her class from the Women’s Medical College of Pennsylvania, one of the first medical schools to accept women. Because Nebraska is 1500 miles from both East and West Coasts, it was popular during World War II for military plants. Forty percent of all ammo used during WW II was made here, as were bombers and depth charges. During World War II, camps for German and Italian POWs were located here. Many of the POWs happily worked on local farms, in place of the farmers who had gone off to war. That is just a fraction of what I learned, but I hope it is enough to make you want to visit and learn more.